With its long sunsets, silica beaches, and the lovely Cape Le Grand National Park not too far away, Esperance truly is a picturesque part of Australia. If you are crossing the Nullabor, it may be the first, or last, big town you go through if you take the southern route through WA. It has all the stuff you need to stock up, but a word of warning, the tap water is far from the best tasting around. There is also a really good mechanic workship in the area called Stagg's Mechanical Repairs. If you need to get something checked after the Nullabor, or want something looked at before, I'd highly recommend him. We made it our home base in southern WA for about 3 months. Although between writing my third book, completing the finishing touches of my second book, Silvaste's Spear, and working an evening job, I really didn't explore the place as much as I would have liked. Esperance is home to the awesome Lucky Bay Brewery and some really nice beaches, Twighlight Beach being the local favourite. A lot of the days between September and December were quite cold, and incredibly windy, and if going for a swim was on the agenda, you either had to go early in the morning, or wait for the easterly winds. We did go in the drink on a couple of occaisons, and the crystal clear waters make it truly worth it. Another interesting thing to see in Esperance is "Pink Lake" despite it's name, it is very rarely actually pink, and from what I've heard from the locals, it is pink about as often as the Todd River flows! We had a bit of time to spare one sunny evening, so took a photo with it as pink as it gets, well the sky was pink anyway! It is still worth taking a quick stop to enjoy the view, just don't get your hopes up for it to be pink! Denmark is another of those beautiful locations nestled on the south coast of Western Australia. We went for a day trip, with the intention of checking out Bartholomews Meadery, Boston Brewery, and scoping some of the scenery, coming to the conclusion that you could easily spend many more days in Denmark and we can't wait for our next visit! Ever since sipping the godly nectar that is mead at the Michigan Renascence Fair, Jen and I have been on the lookout to find some more of the stuff here in Australia. Earlier on the year you may recall the “Game of Thrones” themed night we attended with the HEMA fighters. We did get our hands on some mead at this event, however it was more like a cider than the divine wine we were on the lookout for. Bartholomews Meadery was our hope to find this beverage we sought, and they had quite a nice drop indeed! They brew a few different meads, but are waiting for the bees to complete their job so they can fill their shelves with all their varieties! We sampled three different meads, Sweet Forest Mead, Berry Mead and a Cinnamon Blend. The Sweet Forest Mead was pretty much smack bang on with what we were looking for, a nice sweet honey flavoured wine, so we grabbed a couple of bottles to enjoy later! The Berry Mead was interesting, similar but with a bit of a fruity flavour, and we decided to grab a bottle of that too! The Cinnamon Blend was served hot, and seemed like a very British type thing, would be a lovely night cap on a cold night. They also had a great variety of honey, which you are free to sample. They even had a chocolate honey, which was awesome! We also managed to grab some more tasty ginger honey which we have been missing since we visited the Honey Place over near Coffs Harbour. To finish off a lovely morning of honey sampling, we found ourselves licking away at some honey based ice cream! Bartholomews Meadery is set in a beautiful spot, it is quite relaxing to just sit amidst the delightful smelling bushland. Inside the shop there is also a glass hive display, so you can watch some beers making their honey. They have 300 locations where they collect their honey from, and they are all located away from most farm land, canola in particular. This gives them a variety of unique and delicious Aussie blends. Margot and Finn gave us great customer service and we'll definitely pop in again for some more mead, and ice cream... and chocolate honey in the future! Now that we were on a honey buzz we thought it was best to burn some of that energy! We went down to William Bay National Park, which is known for its artfully sculpted granite outcrops along the shore line and it's turquoise waters within its bays. Just like the rest of southern WA, there were plenty of wild flowers still in their spring bloom. First we went for a small walk to check out the Elephant Rocks, a collection of granite boulders that look like elephants playing on the beach (above). We then returned back over to Greens Pool where we decided to go for a bit of a dip. The warmer weather starts a bit later this far south, and quite often this western chunk of the south coast has quite a chilly wind blasting through it. When the wind isn't too bad and the sun is operating as it should on an almost summer day, it's quite enticing to ignore how cold the water is and just get wet! We weren't the only ones taking advantage of this delightful weather, there were plenty of people, and fish also enjoying the cleansing ocean water. I even had a starfish peaking out from under a rock to say gday. Next we moved on to Willoughby Park to visit the Boston Brewery and it was a top location for a post snorkel feed! We grabbed a couple of beer paddles, which was a good plan, as all their beverages wouldn't fit on a single paddle! With two paddles, we had to double up on two beers, which we decided on the stout and nut brown, not a bad choice at all! Boston Brewery had 10 beers to sample: Hefeweizer, Lager, Indian Pale Ale, Rye Pale Ale, Amber Ale, Maibok, Rauchbier, Nut Brown, Stout and a Ginger Beer. The Hefeweizer had a bit of a banana like flavour, which was odd, but tasted really awesome with the Pork Belly. Their lager was a bit too bitter and hop friendly for me to really consider a lager. The Indian Pale Ale was a pretty smooth for an IPA, yet retaining that fruity hopiness you'd expect. The Rye Pale Ale, smelt like passionfruit, very hoppy with a bitter aftertaste. I didn't rate the Amber Ale when I first tasted it, but returning to it after eating some calamari, I felt I could taste more in it, giving off a honeyish burnt flavour. The Maibok was quite malty and burnt, while covering the 7.5 alcohol taste.The Rauchbier had a smoky baconess about it, quite hoppy but not bad. The Nut Brown ended up being my favourite, it was a slightly burnt American style dark ale with, you guessed it, a nutty flavour! Jen's favourite was the Stout, burnt coffee flavours, slight hit of hops while remaining smooth and creamy. Lastly was the ginger beer, which tasted a little more gingery than a lot of other craft ginger beers, but still had the sickly sweet cordial taste over the top. For our meal we shared a platter that goes with the beer tasting! It was a pretty cool idea, the only down side is they didn't have any notes of what goes with what, so we were pretty much winging it. This worked out fine, as good food and good beer usually go together without too many worries! The property also had a winery, but due to time constraints we weren't able to visit on this particular trip, but there's always next time! Not long after arriving in Esperance, I started an evening job and have been working really hard on writing more on the Necrosanguin series during the day. Because of this I haven't been exploring this beautiful region as much as I could be, I also haven't been dedicating any time to the Trooprock blog either! But just recently, after completing a productive week of writing, we decided to take a weekend trip to Albany to catch up with Jen's parents, who were also visiting Albany. With a population of about 34,000 Albany is much bigger town than Esperance. It has what you'd expect from a town of this size on the southern coast of Australia, plenty of shopping opportunities, cafes, bars and nice attractions just on the outskirts. One of the first destinations we hit, was Torndirrup National Park. Here you can find some magnificent granite like rock formations by the wild waves of the southern ocean. It is all easily accessible by a raised pathway, which runs direct from the car park, to both viewing platforms. One of those platforms shows off the Natural Bridge, the fruit of an artistic display of erosion, giving you a window to the wild waters. On the way to the Natural Bridge, we saw a turtle, a giant turtle! He was made of rock, and we may have been using our imagination a little, but I'm sure with a little imagination you could see many different things in these rock formations! The second platform is known as the Gap, and this is absolutely amazing! The raised platform continues slightly over the edge of the cliff, giving you an amazing view of the ocean crashing against the cliffs, sending giant explosions of water into the air, while you stand comfortable 40 metres above. We stood here just staring for quite a while, and I think this view could obliterate ones stress with ease! There was also a lighthouse in Torndirrup National Park, we never got around to checking it out though, as there were a couple of people who had recently had their cars broken into and it deterred us from leaving the car behind in a secluded location. It is really sad to see this kind of activity occurring in these places where people go to relax and get close to nature, but it made me realise how lucky we are to have not been broken into. Also one would need a truck to steal all the junk out of our Troopy, and even if someone did, I doubt selling all our clothes, bedding, pots and pans would cover the cost of fuel for the truck! Regardless of what you do travel around in and where, I'd just like to remind you to take your valuables with you, or at least keep them out of sight while you are not with your vehicle. The last destination within the National Park we visited was a set of blow holes. It was a nice walk out, however the tide was too low to shoot water up and out. Standing close though, did blast you with one heck of a hit of air! Returning to town, we decided we wanted to sample some of the local beverages. We had heard of the Wilson Brewing Company, a new brewer in WA, but we later discovered they won't actually open until December. Instead we ended up at a distillery called Limeburners. They do not offer samples as such, more of a bar, where you can buy nips of each of their spirits. The nip prices ranged from $5-$15. I sampled a few of their beverages, but found them a bit rough for my liking, a little more time in the cask could have made them a bit more pleasant. In the end I did enquire on the price of a bottle, as I do like to support local businesses while I travel, but at over $100 a bottle, I decided I'm much happier to buy an aged, smooth Scotch or Irish Whiskey at a somewhat lower price when I need another bottle! Next we went in to The White Star in Albany where they had a few beers that were made in the pub under the banner of Tanglehead Brewing Company. They had 4 beers on tap which we grabbed a paddle for, stout, wheat, lager and a ginger beer. They were refreshing and mild beers. It more feels like extra beers on tap, rather than a brewery though. The brew room is at the heart of the pub, with glass windows, which is pretty cool. The brewer actually lives in Perth, not Albany, so I assume he just comes down to setup and keg etc. while keeping the batches relatively simple. Later we did find ourselves at a pub called the Hybla Tavern, just down the road from the caravan park we were staying at. They had a beer called Rough Seas Pale Ale, which happened to be from Wilson Brewing Company, so we bought a couple of pints. It was a much refreshing hit after the other drinks we had sampled. What you'd expect from a clean crisp pale ale, a little cloudy and bitter to call perfect, but the publican informed us the recipe is being changed to perfect the Rough Seas! It wasn't too bitter though, I ended up with another pint... and a full growler! While we sat on the deck of the Hybla we watched a bunch of Black Cockatoos flash their bright yellow tails about the sky, while the clowns of the sky continued to galah about. One particular galah was pretty adamant it was a Christmas ornament. Before returning to Esperance, we did check out a little beach, called Little Beach, in Two Peoples Bay National Park. This place, like a lot of the southern coast was spectacular! It was also possibly the warmest day this summer. Actually it definitely was, we discovered this with a 5 hour drive with no aircon! We went for a walk with Jen's parents around the beach, said our goodbyes, then grabbed our snorkelling gear for a bit of an explore! We found the main beach a little rough, but if you walk all the way down the end, over a small hill and through some rocks, you will find a really calm and stunning spot to spend some time. It was almost our own private beach, with private waterfall and everything! We saw a nice variety of small tropical fish and abalone, nothing too exciting, but it felt amazing getting back in the salt water after what feels like the longest winter of all time! This week's post is another about beer. 'Why is Jeni writing another post about beer?' you may ask. Beer is for blokes. Well if you knew what I knew you would perhaps change your mind on that fact. More on that in a moment, but the simple answer is that I enjoy the taste and variety of beer. Do what you love is something us here at Trooprock Aussies do best and just because females usually like wine better than beer doesn't mean there can't be exceptions. Currently we are basing ourselves at Esperance. We are hoping to stay for the summer. During the first couple of weeks here we had some shocking weather. We did venture out to some of the national parks and beautiful beaches of the area but we would like to visit again before we write a blog post about them. Today's post is about a local boutique brewery in Esperance. I wasn't actually searching for one, but someone had posted something once on the Esperance Community Facebook page about it, so I did some research. It is called Lucky Bay Brewing, is opened 2-5:30 Friday, Saturday and Sunday and is located on the west side of town near where we were house sitting at the time. One Sunday afternoon we were on our way back from town after having visited the local markets when we decided to stop in. We were early and couldn't find where it was despite having the address for it, but we learnt later that the sign only gets put out the front when they are open. It is owned and run by two locals Nigel and Robyn. For a brewery that has only been up and running for 11 months, it certainly has some good vibes about it. Tastings for $10 per person which includes a tasting of the brewed beers that are available. Each beer tasted is not quite a full middie, but in total about a pint will be consumed (and extras if Nigel happens to be changing over a tap), $15 for tastings and a tour of the brewery. Nigel and Robyn are the owners and both are lovely people who like to have a chat in between pouring you a beer. Both are great at customer service, know their product and have some good information and background knowledge on it. They also stock 2L Growlers from Keg King that can be refilled by them, and most of the pubs that stock their beer. Esperance is considered to be in the gold fields region, but that also means it is in a region that grows wheat, and barley (used to make malt). The brewery here is one of the few in Australia that is genuinely local, and the only one currently to use up to 75% raw barley. Their beers can be found in a number of pubs in Esperance, and even expanding to some pubs in Albany, and Kalgoorlie. They have a variety of 7 different beers, (currently, but with more on the way in the new year), ranging from 3.4% alcohol – 6% alcohol. The beers are even named after local beaches and landmarks. Sandy Hook is a Barley Pale Ale and is their most popular beer. It is also Cameron's favourite. Thistle Cove is a Scottish Ale and is one of my favourites as it has sweet hints of malt. I think being Australian and growing up drinking Milo accounts for my love of malt flavours. Skippy Rock is a Kolsch which is a German style Pale Ale. The Homestead is a Belgian farmhouse style ale. Just watch yourself on this one as it is 6% alcohol but very easy drinking. The Tanker is a dark ale that has a tempting coffee aroma. Cyclops is an Indian Pale Ale, (commonly shortened to I.P.A), usually very strong hops flavour but Lucky Bay Brewing have done well to make it more balanced. Burnt Sticks was brewed as an accident with incorrect quantities that was supposed to be made into the Black Jack Pirate Porter, which now won't be brewed until the New Year, but it is an accident that turned out well. It has a beautiful coffee colour in the foam head when poured, with a delicious, smokey (not burnt) flavour. This is my other favourite, but they are all delicious! 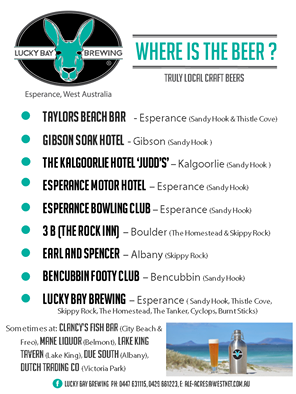 You will notice that of the pubs that do stock Lucky Bay Brewing that it is all different. Market Research has been done at these pubs to see what kind of beer is consumed the most, and such beer has been supplied to match the demand. Our, (mine particularly), interest for tasting a variety of beers and learning about general history of beer began in 2012 when Cameron started home brewing. We didn't have the blog set up back then but in June this year, (2016), Cameron wrote a post regarding home brewing. Since the beginning of 2013 we have been travelling on and off and it would be difficult for us to brew in the troopy as we already have very limited space. In 2014 we briefly visited Ireland where we did a tour at the Jameson and Guiness factories. These two tours were both very interesting and informative. For Christmas last year my mum had found some Beer and Brewing magazines so gave them to us. There were many interesting articles in these about different beer styles, different ingredients, the history of beer in different countries. The article that I remember the most was about women and beer. You may be interested to know that women were actually the first beer brewers, and it goes way back to ancient Egypt times. Over the time it went hand in hand with baking bread which makes sense as similar ingredients are used. Women were the main drinkers of it as well. At weddings a bride-ale was created and sold at the wedding and the profits were a gift to the couple. For centuries it was brewed and sold entirely by the women, and each household tended to have their own recipe. It was only when men saw the commercial value and profit in it that it started to change hands. In recent years perhaps you have noticed an increase of variety in the dockets you get on the end of a Woolies or Coles reciept: Little Creatures, Matilda Bay, James Squire, Coopers. Microwbrewing, homebrewing, and craftbrewing have been on the rise in Australia for at least the last 15 years and will only continue. However there are some craft beers thats are claiming either 'craft', 'microbrewery', or 'local', that may have started this way, but have now been sold in the mid nineties to the bigger companies. Whether you know this or not most pubs you visit will either stock Lion Nathan's branded beer or Carlton & United Breweries. Local microwbreweries hardly stand a chance. Here's some common Lion's brands: XXXX, Tooheys, James Squire, James Boags, Hahn, EMU/ Swan (originated in WA and still says it is WA is now actually produced in SA), 5 Seeds. Here's some common Carton & United Breweries (CUB): Victorian Bitter, Corona, Carlton Draught, Matilda Bay, Cascade. Depending on which major company owns your particular local watering hole will depend on what is served. After talking with Nigel and Robyn about how their beers are in some local pubs we found out it is an interesting and sometimes painful process to get it there. The beer taps/ pubs owned by the 2 major companies are not allowed to have any other branded beer flow through the taps. If a local or craft beer is of interest to the publican, they are allowed to stock it (some of the time), but they must provide separate beer taps and lines. More often than not the pub does not have separate taps and lines so they just stick with what they are allowed to serve. Other times they are more flexible and have their own taps and lines that they can put in what ever they want or they tell the local brewer that they will have to supply their own taps and beer lines. If you are lucky enough to find local beers, it will usually be in a separate part of the bar, or you will have to ask for it specifically and most of the time the label/ tag is not on the tap either. This is our last post on our journey east from Bunbury to Esperance where we are hoping to spend the summer. Like always though our plans and adventures are never quite set in stone! Sometimes I feel our attention span is too active. There is so much to see around Australia. We have now been travelling on and off for 3 ½ years, and I feel we have barely scratched the surface. We have mentioned climbing and walking over granite outcrops. Many of these walks took less than an hour, some closer to 30 minutes. Before all of these, we went bushwalking all day at Wellington Dam which was great and kickstarted our journey with oomph but after all of these smaller walks, we were starting to feel like we were just ticking the boxes, doing the walks, taking the photos. We wanted to do a longer bushwalk or climb again, one that took us more than an hour to complete. At Norseman we saw a picture of a mountain named Peak Charles located in Peak Charles National Park. It looked like a smaller version of Japan's Mount Fuji, or purhaps Walsh's Pyramid in Far North Queensland upon which we climbed this time last year, October 2015. It is smaller than both of these landmarks, but very similar structure to both of them, and looks like a big triangle. Mount Fuji is 3776m, Walsh's Pyramid is 922m and Peak Charles is just a baby in comparison coming in at only 651m high but still 20m taller than the 2nd tallest building in the world, Shanghai Tower, which is 632m. We decided we wanted to climb Peak Charles as it would give us a sense of achievement after all of the other walks and climbs we had done recently. From Norseman there are two ways to get to Peak Charles National Park, and Peak Charles. As you head south from Norseman the first road you will come across is heavy 4WD. Although we have Rocky we felt a little uncomfortable on this road, but thankful for 4WD. It was 50km to Peak Charles but it took us 2 hours! It had heavy corrugations, large ruts that were muddy, and it was very stony many of which looked sharp. The first 29kms were the worst as this section is 4WD and the other is supposedly 2WD (still quite large ruts though) as it links to the other entrance to the highway which is closer to Salmon Gums. Needless to say that the following day we took the smoother road back to the Coolgardie-Esperance Highway and it was much better. The reason we went on the rough track was to check the conditions for a friend who was curious about it. The 4WD road continues to King Lake which we were considering doing but 29kms was enough for us and our mates have a caravan so they won't do it either now that they know how bad the conditions are! If we end up visiting King Lake it will be via the sealed roads. Once we arrived at Peak Charles we read the information signs. There are three sections of this walk/climb. It is rated as difficulty grade 4. The following information is taken from http://trailswa.com.au/trails/peak-charles-walktrail/print. Moderate incline, rough surfaces, very slippery when wet. The start of the trail is well defined and has no markers. It takes you through open woodland across mildly undulating terrain with loose rocks to exposed rock at the base of Peak Charles. From this point the trail is marked by white-tipped poles. Some high stepping onto rocks is required. This section of the trail ends at Mushroom Rock, one of many intriguing rock formations on the slopes of Peak Charles. Steep incline, rough, unstable surfaces. Very slippery when wet. Strong winds. Exceeds walktrail classification as this section requires frequent rock scrambling. Very steep, exposed incline. Rough surfaces. Very slippery when wet. Strong winds. This section of the trail is very steep and requires foot and hand placement in crevices to pull yourself up in places. You must be able to lift your own weight several times. There are no markers and you mst be able to find and assess appropriate hand and foot holds. On the descent you have to crab crawl on your hands and feet with your back to the rock. If you are short you may need to be pulled up in a few places on the ascent by another person and you will have to slide down some short sections of steep on the descent. The summit is largely bare and marked by a tall rock cairn. When we got to Peak Charles it was late in the afternoon. There is a campground right at the base of it which our plan was to stay here and set off early the next morning. The campgrounds have drop dunnies, fire pits and some picnic tables. The walk was challenging but great fun. It took us the recommended time of 3 hours. We took our time, and we enjoyed ourselves. We took about 3.5L of water with us and some snacks. Being granite there were many times we had to scramble to get around, up or down the rocks. This was fine until we came down as we had a brief shower. The shower did not last long and was not heavy, but it was enough to make the granite very slippery, so upon coming down there was a lot more crab walking on our hands and feet. The final section says 'exceeds walktrail classification'. We got to the final section and continued on. It was more difficult than the 2nd section but achievable up until the final 200m. The final 200m is tricky and requires rock climbing skills. You have to boulder (climb without ropes). For me going up was not a problem but coming back down was difficult even for me who has rock climbing experience. Even if you do take ropes and equipment there is not many places to attach safely to. IF YOU DON'T HAVE ANY ROCK CLIMBING EXPERIENCE DON'T ATTEMPT THE FINAL 200M. While I went to the top Cameron waited for me at a nice cave and lookout. I'm glad he trusted his instincts and knew his limits, but was happy for me to finish it for the both of us. I think I worried him though, as you can't see the very top and I was gone for about 15-20 minutes as I navigated and climbed my way to the top. Peak Charles can be seen for up to 50km away as the land is quite flat bar some sand hills so the view as we climbed was fantastic. We could also see Peak Eleanora but to get there was also heavy 4WD so we decided against it. There were many clouds around and it was beautiful to see the shadows sweeping the land, changing the colours rappidly. We returned to the highway that afternoon and the road came out north of Salmon Gums. We decided to camp at Salmon Gums where there is a community run caravan park that only costs $15 per night. It is even powered! Salmon Gums is a tiny country town, but all of the locals are friendly. It was a freezing cold night (the temps went negative) so we decided to warm ourselves at the local pub which had a wood fire. The owners were good for a yarn. Despite being tiny and freezing, we enjoyed our time in Salmon Gums. This was our final night of our journey from Bunbury to Esperance. The next few posts will be about Esperance and the surrounding areas. Today's blog post is about our 2 day journey from Hyden to Norseman, via the Granite and Woodlands Discovery Trail. It is a 300 km dirt road but it is highly maintained so that 2WD cars can go on it. Even after all of the rain that we had in Western Australia over this winter it was a wonderful road to drive, smoother than some sealed roads, and caravaners could easily cross, we even saw a sports car driven by a wildflower enthusiast, although we recommend talking to people with information at either Wave Rock or Norseman first because sometimes it is closed. We took two days to cross as we stopped at all 16 designated stopping places and camped along the way as well. We also recommend getting the flyer/ brochure which is probably one of the best informative flyers we have picked up as it gives the exact distances between stops, how far it is to Hyden and Norsman from each stop, it has two segmented maps of the Granite and Woodlands Discovery Trail, tells you where camping is permitted, where picnic tables are, and also details of the walking trails at McDermid Rock and Disappointment Rock. We've talked about large granite outcrops in some of our recent posts. This section of WA as well as being in the wheat-belt, is also in an area with many granite outcrops, is rich with mining ores such as gold and nickel, and is home to some unique types of forests and woodlands. In this 300km stretch, the country and scenery changes dramatically sometimes as quickly as every half hour. We left Wave Rock at about midday continuing east on our journey and went 136km, almost half way across the Discovery Trail, to where we camped at The Breakaways. Between Wave Rock and The Breakaways are 5 other areas to stop and take a look around, and each has interpretive signs to read: State Barrier Fence, (also known as the Rabbit Proof Fence), Holland Track, (a heavy 4WD track), Forrestania Plots, (plots originally cleared for farm land but left desolate due to the depression), Shire Boundary (where the the Shires of Kondinin and Dundas meet), Grevillea Hill (you can look out over the valley and see flame grevillea far as the eye can see), and finally The Breakaways, (where the landscape starts to change from sandy heathland to mallee and eucalypt forests). The Breakaways was a lovely area with sandstone cliffs that were a couple of metres tall. It was about 3 in the afternoon and the sun was bouncing lots of beautiful colours off the cliff walls. It was a nice area and after we spent about half an hour just exploring, (no designated path), we decided to camp for the night as there were a few drop dunnies, and many camp fire pits around. Honestly the camp fire pits is what actually made us decide to stay! During the night we decided to grab the torches and walk around to see if there was any wildlife about, but it was probably too cold as we only saw a few spiders. The next day we drove the remaining 165 kms to Norseman. Between The Breakaways and Norseman are 9 sites to stop at, and one final walk at Norseman: Emily Ann (so memorable I forgot what it was and had to look up on the internet that told me it was an old mine site, nothing here except a sign), McDermid Rock (granite outcrop), Lake Johnston (a salt lake), Lake viewpoint, Disappointment Rock (another granite outcrop), Woodlands, Gemfields, Lake Cowan Lookout (the lake just out of Norseman), and the Woodlands Walk at Norseman. There is walks at McDermid Rock and Disappointment Rock. Still not really sure why it is called disappointment rock, the view was just as nice as the other view points, but perhaps because it is another granite outcrop that looks similar to all the others. We did find a gnome who had made his home up there though, seeking shelter under a rock, waving at passers by like us. Just be aware if you are in a 2WD going to Disappointment Rock because even though it is only about 100 meters from the road, it is very rough going, be careful not to pop your tyres. There are also designated free camp spots at McDermid Rock and Lake Johnston. Norseman is a gold mining town, although very small compared to Kalgoorlie. It is in between Esperance and Kalgoorlie, and the first proper town you will come across if you have travelled the Nullabor like we did back in March. It also has one of the holes for the Nullabor Links golf course. By the time we had reached Norseman it was a week since we had left Bunbury in early September and as the week progressed we spotted more and more of the colourful wildflowers that Western Australia is famous for in spring time. Well at least the flowers thought it was spring even though the weather had been bitterly cold and some mornings there was negative temperatures! The lookout at Grevillea Hill was coloured orange. At The Breakaways there was a few sections that had a carpet of purple. On all of our walks up on the granite were many varieties of colours. It is a well known fact around the world that Aussies are a lazy bunch when it comes to certain things. The best example is that when we speak everything gets shortened. Certain consonants such as 'd', 't', 'r' automatically get omitted in our speach. This laziness flows into other areas as well. The way animals and places are named is another example. The Eastern Grey Kangaroo is found on the eastern side of the continent and is a grey colour. The Port Lincoln Ring Neck Parrot was discovered in Port Lincoln and has a distinctive yellow coloured ring around its neck. The Great Ocean Road is a road that follows the coastline between Melbourne and Adelaide and you can see the ocean from most of it. Likewise, Wave Rock is a 14m tall rock face that is shaped like a wave at the beach. So you see identification is an easy process in the land of Aus. Today's post is about Wave Rock and the surrounding area. The actual name is Hyden Rock and Wave Rock is just the section that is shaped like a wave. Hyden Rock is located 3km east out from the small town of Hyden, and roughly 340km east-souteast from Perth. It is usually visited if people are going to Esperance from Perth, exploring Western Australia's wildflowers, or perhaps have just crossed the Nullabor and are heading west to Perth. Our last few posts have been about our journey from Bunbury, crossing the Wheatbelt, and eventually down to Esperance where we plan to spend the summer (but that will be a post in a few weeks time). Western Australia often doesn't get as much attention from travellers as NSW and QLD so if small towns want to experience the benefits of tourism, the largest growing industry in Australia, they have to make an effort to get noticed just like the 'Tin Horse Highway' on our previous post. Wave Rock however first hit the world-wide tourism scene way back in the 1960's. A photograph of Wave Rock was entered into a Kodak International Colour Picture Competition in New York and in 1964 amateur photographer Jay Hodges was announced the winner. Shortly afterwards the picture was on the cover of 'Walkabout Magazine' then later also featured in 'National Geographic'. This photo paved the way for tourism to Wave Rock and the surrounding areas. Not only is the shape of the wave realistic, but the vertical colour contrasts add to it as well so it now appears as a wave that has now turned into stone. Hyden Rock is one of many granite outcrops in the Wheatbelt. There are quite a few walks around that you can do. We stayed at the Wave Rock Caravan Park for two nights as a friend had told us that entrance to Hyden Rock and Mulka Cave is included in the price. We got to the park in the afternoon, got set up, looked at the maps, then explored. From the park it is about 100m to Wave Rock. We were there just in time to see some brilliant colours on the rock from the setting sun, but not early enough to catch the sunset when we walked on top of Hyden Rock, we didn't rush it as we were there two nights and allowed for plenty of time the next evening. The following morning after breakfast we followed the rock and path around to the left until we got to Hippo's Yawn and like Wave Rock, the name fits the description. It was cool to see. From here you can just go back to the car park, or continue on the boardwalk loop that takes about an hour. After we had lunch, we drove out to 'Mulka Cave' and 'The Humps' which is another granite outcrop nearby. There are many informative signs along the walks, but the one I remember the most was about how the local Aboriginals used traps to catch goannas. It worked like a trap-door. A big slate piece of rock was rested on some smaller rocks. The goanna would go under the slate, the hunters would knock out the smaller rocks and the goanna would be trapped underneath. Even today goanna is a favourite food for many Aboriginal groups across Australia. Hyden has had to be resilient from the start due to lack of infustructure and drought, but it has lead to an incredibly strong community spirit that is still vibrant today. In recent years the town used the help of an artist to help create some scrap metal sculptures, that look comical, but each sculpture tells the story of the town and there are plaques with each one. The first hotel opened in the 60's. Money from the hotel has helped to fund and establish many of the other facilities around the area too such as the Caravan Park, local shops, the Wildflower Shoppe Cafe, the Wildlife Park, the Lace Place Museum, the Miniature Soldier Museum, the Pioneer Museum and many other local facilities. If you are road tripping in Western Australia, Wave Rock is worth a visit. For more of our posts from this area check out our 'Destinations' page where Cameron has made it easier to search our posts via location.